Austral indigo. Image by Ian Moodie. A delicate, open shrub that is part of the Pea family and found throughout Australia. It grows to a size of 1.2m x 1.2m and has feather-like leaves, openly spaced along the stem. It has a fresh, clean and unblemished appearance in all seasons. 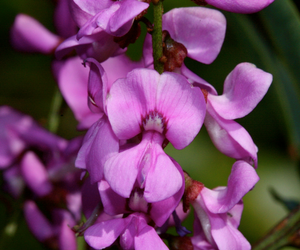 Austral indigo produces an abundance of beautiful pink or mauve blooms in tapering sprays from August to September. Bright green pods hang from the Austral indigo once it has flowered. The ripened pods produce a square-shaped, hard seed. A beautiful specimen plant for a partly shaded, well-drained spot. It needs regular watering during dry periods and to be pruned to maintain its vigour. It can be used to great effect when planted under trees or as a hedge or border. In Boroondara, the Austral indigo can be seen at Yarra Bend Park. The Austral indigo provides a source of food for butterflies. Traditionally, Aboriginal people used the flowers to create a blue dye and the crushed roots to stun fish. Gold dust wattle. Image by Ian Moodie. An open, spreading, small- to medium-sized shrub with attractive bright green, rounded foliage evenly arranged along the stems. It has an abundance of bright yellow ball-shaped flower heads along arching branches. They flower from August to November. The spiralled, green seed pods change to brown as they mature. The seeds drop from the pod after maturity. It is a good, low specimen or screening plant that adapts to well-drained soils. It is drought and wind tolerant and looks lovely planted below established trees on exposed areas. Trim lightly to develop a more compact and dense form. It often self-seeds in the garden. 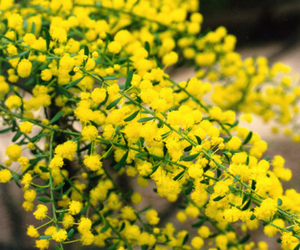 In Boroondara, Gold dust wattle can be seen in Markham Reserve, Ashburton. The blossom and seed pods attract a wide variety of native birds and insects that feed on them. Golden spray. Image by Ian Moodie. A willowy, tall, leafless shrub with pendulous branches and long, needle-like branchlets. 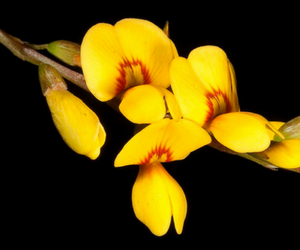 It produces long drooping sprays of yellow pea flowers from October to February. Golden spray can be easily propagated from the single seed contained within the soft, oval-shaped pods. Golden spray grows best in full sun. A fast growing attractive shrub that provides a brilliant display when in flower, it can be adapted to drier conditions if it is watered during summer. In Boroondara, it can be seen along Back Creek in South Surrey Park as well as at the intersection with Anderson Street. It provides insects with a home and in turn is a source of food for insect-foraging birds. Showy daisy bush. Image by Ian Moodie. A soft, open shrub with dark green, lance-shaped leaves, growing to a size of 3m x 2m. 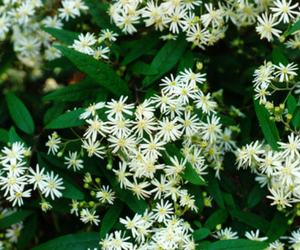 It may also be known as Olearia stellulata. The Snowy daisy-bush has masses of small white flower heads with about 15 ray florets in large, loose bunches. It flowers from September to December. The seeds, known as achene, are borne through the air on a silky hairy pappus. The Snowy daisy-bush may only produce a few viable seeds if damaged by insects. It grows best in part or full shade or a sheltered position. The Snowy daisy-bush prefers a moist, well-drained soil and is an excellent shrub to brighten a sheltered corner of the garden. Once established it can accept a drier soil. It is a beautiful screening or specimen shrub and provides attractive cut flowers. It is presumed extinct as a naturally occurring population in Boroondara, however, it is being reintroduced into sites along the Yarra River corridor. The Snow daisy-bush attracts insect-eating birds to your garden. Sweet bursaria. Image by Ian Moodie. 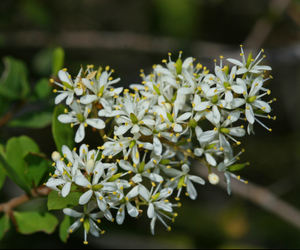 Sweet bursaria is a narrow to rounded shrub or small tree 2m x 1.5m in size with shiny dark leaves and spines along the branches. Plants tend to have more spines and smaller leaves in drier sites. Sweet bursaria has massed bunches of tiny, creamy white flowers at the ends of its branches and flowers from November to February. Attractive brown seed capsules are held on the branches for a long time after flowering. It grows in full sun. It is valuable in the home garden for its attractive flowers, leaves and seeds, and can be useful for screening or as a small shade tree. It has low to medium water requirements and is drought and lime tolerant. For the plant to retain its vigour the tips need to be pruned. In Boroondara, Sweet bursaria occurs along the Yarra River and Gardiners Creek and in grassy woodland sites such as South Surrey Park. It provides nectar for birds as well as food for butterflies, particularly for the rare Eltham Copper Butterfly.